Are you interested in a hands’-on career? Check out this list of the top 10 highest paying trade and technical careers to learn more about opportunities which will allow you to roll up your sleeves and make good money, too. Elevator installers and repairers are responsible for assembling, installing and performing maintenance on elevators. They also work on escalators, moving walkways, dumbwaiters and chairlifts. Median annual salary is $70,910 per year. Most people working in this field completed a four-year apprenticeship program. Along with on-the-job training, apprentice elevator installers and repairers take classes in mathematics, blueprint reading, electrical and electronic theory and safety. Electrical and electronics repairers use specialized software and other methods to detect the cause of equipment malfunctions. Much of their work involves removing and replacing defective items, although they may retrofit older units. Median salary for this job is $65,230 per year. Graduates from an Associate’s degree or trade school program in electrical equipment and electronics are preferred, but some employers will hire someone with a high school diploma and provide on-the-job training supervised by an experienced technician. Boilermakers make and repair boilers, closed vats and containers used in industry for holding liquids and gases. They also erect and repair smokestacks, blast furnaces, storage and process tanks, air pollution equipment. Boilermakers are paid a median salary of $54,640 per annum. Training to become a boilermaker is done through apprenticeship programs or completing a program at a trade school and following up with on-the-job training. Construction and building inspectors are responsible for examining various structures to ensure that they are being erected in compliance with local building code and zoning regulations. Inspectors visit job sites to look at buildings, bridges, dams, streets and highways. The median rate of pay for this job is $52,360 per year. Some construction and building inspectors hold a degree in engineering or architecture, while other people working in this career have completed a community college program in building inspection technology. A good portion of training occurs on the job, with new hires working with an experienced inspector. Electricians install and maintain electrical systems in homes and all types of buildings. They must be skilled at reading blueprints and use a number of hand tools, such as screwdrivers, pliers, wire strippers and knives, in their work. The median salary for electricians is $48,250 annually. Most electricians have completed a four-year apprenticeship program. They gain skills through on-the-job training and classroom instruction. Apprentice electricians complete a minimum of 2,000 hours of practical training and 144 hours of classroom instruction each year. Pile-driver operators operate machinery used to push concrete, steel and wooden posts into the ground to support buildings. Most of them work on large-scale construction projects. Pile-driver operators earn approximately $47,860 each year (median salary level). A three-year apprenticeship program is offered by the International Union of Operating Engineers, but some workers have completed a trade school program and/or have learned the skills required to operate the equipment on the job. Brickmasons and blockmasons, commonly known as bricklayers, are responsible for building and repairing walls, floors, walkways, fences, chimneys and other structures. They are skilled at working with bricks, concrete blocks, and other building materials. The median salary for bricklayers and blockmasons is $46,930 per year. Some bricklayers start working as helpers or laborers and receive on-the-job training. Technical schools may offer masonry courses which teach skills required for this job. Apprenticeship programs are available and bricklayers spend a minimum of 144 hours in class studying math, blueprint reading, sketching and layout work. The practical training component of the apprenticeship program lasts for three or four years. Plumbers work on the water, drainage and gas systems in homes and other types of buildings. A plumber’s job description also includes installing appliances, such as water heaters, waste disposal units and dishwashers. Plumbers also install fixtures, including sinks, bathtubs and toilets. Plumbers earn a median salary of $46,660 per year. The majority of people working in this career have completed a four or five-year apprenticeship program which includes on-the-job training and a minimum of 144 hours of classroom instruction each year. Structural iron and steel workers install steel or iron girders and other materials to erect buildings, bridges and other types of structures. Their work also involves placing steel bars or mesh into concrete to reinforce it. Median pay rate for this job is $44,540 per annum. Most employers are interested in hiring a candidate who has completed a three or four-year apprenticeship program, but some are willing to offer on-the-job training. Workers must be physically fit and have no problem with heights. 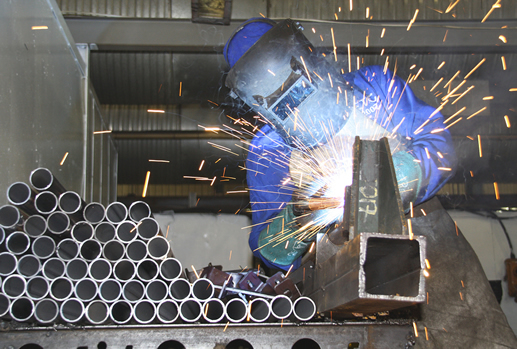 Sheet metal workers are employed by manufacturers and in the construction industry. They make and install duct systems used for heating, cooling and ventilation, and work with siding, rain gutters, roofs, outdoor signs and rail cars. The median rate of pay for sheet metal workers is $41,710. Training to be a sheet metal worker involves either completing a four or five-year apprenticeship program or participating in on-the-job training. Taking mechanical drawing and general shop classes in high school provides good preparation for this type of work.